As you’ve been diving into the Gospel of John these last weeks, you’ve already covered a lot of ground, including Jesus’ encounter with his mother at the wedding at Cana … Jesus’ encounter with Nicodemus in the dark of night … Jesus’ encounter with the Samaritan woman in broad daylight by the well. 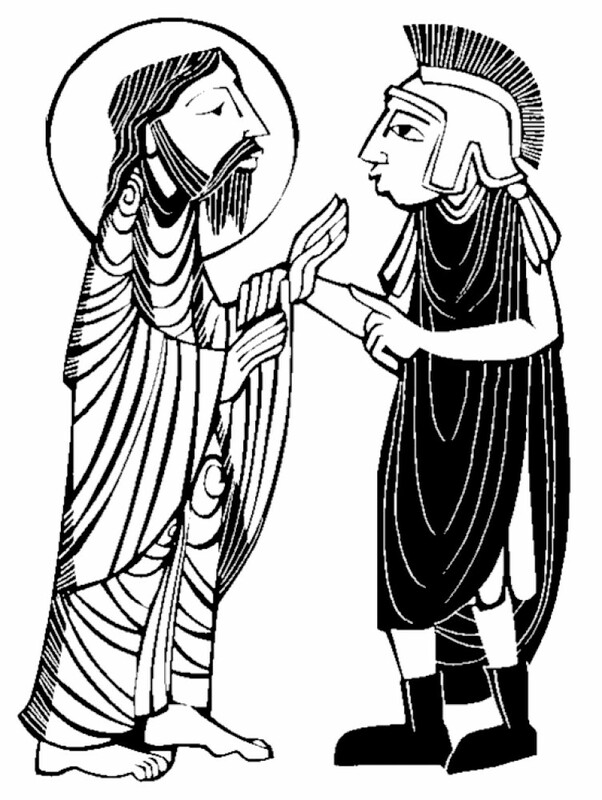 Now Jesus is encountering an official who comes to him, seeking healing for his son. It’s an understatement to say that each person who meets Jesus is very different. So what do we know about this man? We don’t know much – this story is really short. We do know this: the man is a royal official, that is, a member of Herod’s administration. You remember Herod – the Jewish king appointed by the pagan Emperor. Herod’s the one who will have John the Baptist’s head on a platter, and, in the end, agree to have Jesus killed on the cross. Many Jews regarded Herod not as a revered king, but as corrupt, a sell-out, willing to do anything for the Emperor to hold on to his power – and anybody who served under him was guilty by association. So this royal official who approached Jesus? He was likely powerful, wealthy, and intensely disliked and distrusted by most of the Jews. But notice what happens: this powerful royal official approaches Jesus. What’s his attitude? He could have felt entitled, like Nicodemus did when he self-righteously approached Jesus – but I doubt it. Instead of sending his servants to Jesus, this man makes the long trek from Capernaum to Cana – about 25 miles - to talk with Jesus face-to-face. Or the official could have come feeling ashamed of the judgment of the crowds, like the Samaritan woman did when Jesus spoke to her – but I doubt that too, because he doesn’t hesitate to come straight to Jesus with his petition. No, I think his attitude is most of all vulnerable and desperate – desperate for Jesus to save his son’s life. I’m not sure what to make of Jesus’ response. Jesus says, “Unless you see signs and wonders you will not believe.” It sounds like a rebuke – in fact a lot like the brush-off Jesus gave his own mother at that first sign in Cana when she asked him to turn water into wine. I love that Jesus’ brush-off doesn’t deter the royal official any more than it deterred Jesus’ mother. The official doesn’t let Jesus’ rebuke stop him! Instead, he implores all the more: “Sir, come down before my little boy dies.” And without even seeing what happens, the official believes Jesus’ word: “Go; your son will live.” It reminds me of the end of John’s Gospel after Jesus’ resurrection appearances – to Mary in the garden, to the disciples in the upper room, to doubting Thomas – when Jesus says quite frankly, “Blessed are those who don’t see, and yet believe.” Blessed are those like the royal official, who could have used his power to make demands, and instead trusts Jesus before he has any reason to, before he has any evidence that his son will live. That is true faith – faith shown not by Jesus’ closest disciples, not by the most pious scribes and Pharisees, but instead by a man who was considered a corrupt, distrusted political sell-out. So what does this have do to with us? I can’t speak for you, but here’s what touches my heart. Just like Jesus did in his encounter with Nicodemus, and just like Jesus did in his encounter with the Samaritan woman, Jesus sees this royal official for who he really is. Jesus doesn’t just see his status – a man with power in the royal household, and rich. Jesus doesn’t just see his religious standing – a man who seems to have sold-out for political gain. Instead, Jesus sees him as he really is - a man … a father … a parent with a gravely ill child. At the beginning of this story, this man is a “royal official.” By the end of this story, he is a father with a son … a father with a dear child. By the end of this story, his son receives the gift of life … but just as crucially, this man receives the gift of his own life too. He does not go back to his old life as he was. He believes, he trusts Jesus, and he and his whole household are transformed. Who knows whether or not he stays in his same job or not … but if he does, he won’t be cynical, or corrupt, or a sell-out anymore. He has his life back … he has his self back. And so it is with us when we encounter Jesus. Not necessarily receiving what we ask for – we can’t pretend to know that our children will be healed, and for some of us here, that is profoundly what we pray will happen. And when we come begging at the throne of grace, we can’t know that our own illness will be cured, that we will find the right job or the perfect partner or that the world will find peace. But this, we are promised: we will receive the gift of our lives back, a gift that many of us may not even know we need. Maybe I lived in Lake Forest too long, a wealthy suburb of Chicago. But this is what I learned there: each of us has a persona, a label or identity developed for ourselves or slapped on us by others. I’ve thought about this a lot lately for myself. Until recently, I was the pastor of a large, successful congregation; last year I left under somewhat painful circumstances. Now I’m a fundraiser for a seminary, and most of the people I encounter have no idea that I’ve been a pastor unless I tell them. Rarely do I preach or teach or visit the hospital; never do I perform baptisms or weddings or funerals anymore. I’m the same person, with the same gifts, but with an utterly different title and role. Who am I, really? Or I think of a man I met recently in Pittsburgh. Dan has shared his story publicly – he was a faithful church member and very successful businessman, a millionaire many times over. Then he decided to sell his business; unfortunately, he sold it to a crook who scammed him out of every dollar. Then, his wife left him. No longer is he invited to serve on major boards or attend fancy galas. Now he volunteers full-time in an African-American community, building ties between his upper-class white community where he had lived. He’s drummed up coalitions, promoted affordable housing, developed learning opportunities for underserved kids. He claims he wouldn’t want his old life back for all the money in the world. He’s the same person, with the same gifts, but with a totally different use of his time and talents. Who is he, really? Or I think of a man I know in Lake Forest – he too was successful by every measure. He built his reputation as a partner with Citadel investments, made boatloads of money, did great charitable work, married with a young family, yada, yada, yada. And then, his kids nearly died of a peanut allergy. And suddenly, none of the rest of this mattered. Dave and his wife dropped everything to pursue this single cause – developing an advocacy group to research nut allergies, drumming up support from their friends. Now researchers are close to a cure, and Dave told me recently that he’ll go back to investing himself in business – not to make more money, but to build up the street cred and connections to leverage when he finds another major cause. Who is he, really? Or my Dad who used to be a dentist, Clerk of Session, married with kids … now he’s 95 and in a nursing home, but still playing duplicate bridge every week. Who is he? Or a young friend who has a PhD in political science from a major university, won every award in the book, but can’t find a job anywhere. Who is she? Or another friend who gave up her legal career to get married and have kids, and now the kids are grown and she honestly has no idea what to do with herself anymore. Who is she? As for me, it’s not always easy to remember. Most of my life, I’ve clung to my identity of my grades and my titles, my work and my family. I’ve basked in other people’s praise, and conversely, wanted to hide in the dark when I’ve failed. But over and over, I’ve discovered what many of you also know: that in our times of greatest need, all the stuff by which we are defined - our titles and labels and judgment and hype – all that evaporates. Because when we’re vulnerable, we discover what’s been true all along – that we’ve never really been our beauty or our grades, our successes or our failures, our paycheck or our trophies. And then – precisely then - when we come to Jesus empty, when we come to Christ in our naked vulnerability, he sees us as we really are – and we are blessed to find ourselves again, our true selves, as a valued, beloved, cherished child of God. And maybe, just maybe, our eyes will be open to see others like that too. Amen.